I was sent a copy of this book, by the author, in exchange for an honest review. The synopsis intrigued me and I was excited to see if the story lived up to what I'd hoped it would be. I'm happy to say I wasn't disappointed, (except for the cover, which I don't love). The overall story has a very Harry Potter feel, but in a world similar to Lord of The Rings, full of Knights, Dragons, Elves, Dwarves, sword fighting etc. 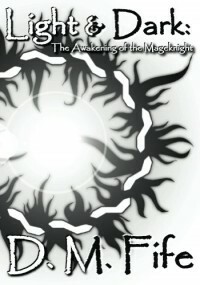 Danny Firoth is an ordinary 13 year old kid who finds out that a card game about Dragons and Knights, that he thought was just an ordinary game, is in fact a very real world. On top of that, he is told he has the 'gift of sight' and is offered an opportunity to go to a special school to train as a Knight of the Light. The characters are wonderful and well developed, and the friendships in the story were believable. I also really liked that some of the mentor type characters had a warm pressence that reminded me of Dumbledore from Harry Potter. The dialogue is descriptive and eloquent. The training process that Danny and his friends go through is interesting and fun to read. This is the first book in what is to be a series, which I'm excited about. The ending was good, secrets were uncovered, but I'm looking forward to the release of book 2 to find out what will happen next, as many things were (purposely) left unresolved and unknown yet. I really enjoyed this story from start to finish. I'd love to see it as a movie someday. If you like Harry Potter or fantasy stories in general. I think this book is for you.